Growth promotion claims will be removed from the labels of all medically important antimicrobials (MIAs). MIAs are specific drugs (such as Penicillin) that are preferred options for use in human medicine, with few alternatives. See Animal Owner FAASTsheet #3 for more on MIAs. In the past, MIAs have been used at low doses to promote growth and feed efficiency in livestock, but this exposes bacteria to these drugs without killing them in most cases. This allows bacteria to develop resistance to the drugs, which can then spread, resulting in infections in people and animals that are difficult to treat. For more information on antimicrobial resistance, see Animal Owner FAASTsheet #1 and Animal Owner FAASTsheet #2. Global recommendations to help combat antimicrobial resistance (AMR) include eliminating the use of MIAs as growth promotants. 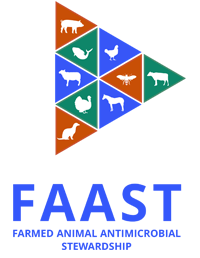 You can no longer use MIAs to promote growth or feed efficiency in otherwise healthy animals. The majority of these products have other uses, such as treatment, prevention and control of illness, and will therefore still be available on the market. However, you will require a prescription to access these products (see Animal Owner FAASTsheet #6). A few MIA products that only had growth promotion claims will no longer be available for sale. Category IV antimicrobials (those considered not medically important), including ionophore and coccidiostat products, will not be affected. See Animal Owner FAASTsheet #3 for more on the categories for antimicrobials in Canada. Talk to your veterinarian about your current use of antimicrobials and the availability of the products you use moving forward.